South African banks lost R60-billion in the hours following President Jacob Zuma’s Cabinet reshuffle. But that is going to be minuscule compared to what the country stands to lose if the government does not respond appropriately to rating agency Standard & Poor’s (S&P’s) decision to downgrade South Africa to junk status. By JILLIAN GREEN. So begins the investment rating agency S&P’s statement announcing that South Africa’s credit rating was being downgraded to BB+ or in layman’s terms – junk. Moody’s, whose credit rating currently places SA at Baa2 – two notches above junk – is expected to announce its ratings review decision on Friday while Fitch does not set out dates for it rating decisions. S&P’s next review will be in June. Providing reasons for the downgrade, S&P said its decision reflected its view that the “divisions in the ANC?led government that have led to changes in the executive leadership, including the finance minister, have put policy continuity at risk”, and increased the likelihood that economic growth and fiscal outcomes could suffer. It said it believed these party divisions “potentially erode the trust that had been established between business leaders and labour representatives (including in the critical mining sector)”. “An additional risk is that businesses may now choose to withhold investment decisions that would otherwise have supported economic growth. We think that ongoing tensions and the potential for further event risk could weigh on investor confidence and exchange rates, and potentially drive increases in real interest rates,” its statement read, adding that the pace of South Africa’s economic growth remained a ratings weakness. The announcement smashed an already struggling rand, which according to Bloomberg Market reports on Monday night slumped to its weakest level since January. The rand declined as much as 2.3%, and was at 13.6885 per dollar at 19:00. “Yields on the country’s dollar bonds due October 2028 jumped 10 basis points to 5.12 percent, a three-month high, while rates on benchmark government rand bonds due December 2026 rose 13 basis points to 9.02 percent,” Bloomberg reported. The impact of this decision is going to be felt for months and years to come. Dr Iraj Abedian, Chief Executive at the Pan-African Investment and Research Services, Johannesburg, said government had “lost its creditworthiness” – the rating agency did not believe or trust that there was policy consistency, that there was cohesion within Cabinet for it to be trusted with investment grade and that there were prospects of turning the economy around. “This is the consequence of a government misbehaving,” said Abedian. Investors would begin pulling out from Tuesday. Some investors, said Abedian, would take the risk and continue borrowing but would “slap a massive premium” on that debt. Abedian said what the government did next would determine the long-term impact of this downgrade. He said South Africa could either go the way of Argentina – which would see it 30 years down the line trying to repay debts at massive amounts – or it could go the route of South Korea and make the political and financial changes necessary to effect a turnaround in six to 10 years in a “best case scenario”. “We are on a slippery slope – change needs to be effected or hundreds of billions of rands will be lost without even considering the cost of human suffering that will be experienced through rising costs and joblessness,” he said. Former minister of Finance, Pravin Gordhan, was not available for comment on Monday night. Treasury in a statement “noted” the S&P announcement, saying while the leadership of the finance portfolio had changed, government’s overall policy orientation remained the same. “As indicated by (Finance) Minister (Malusi) Gigaba, government has been, and will remain, committed to a measured fiscal consolidation that stabilises the rise in public debt,” the statement read. Treasury said the country needed to reduce its reliance on foreign savings to fund investment and “relying less on debt to finance public expenditure will secure South Africa’s fiscal sovereignty and economic independence”. But DA leader Mmusi Maimane called the downgrade a “clear vote of no confidence in President Zuma, and a direct result of his decision to fire Pravin Gordhan and Mcebisi Jonas last week”, he said, while repeating his call for Zuma to resign. “International ratings agencies have long warned this government that our status is on a knife edge. Zuma has clearly learnt nothing from the market reaction to his firing of then Finance Minister Nhlanhla Nene in December 2015 … This downgrade will result in higher government borrowing costs, less money for basic services, and less job-creating investment. Zuma is on a path of destruction, and must be stopped,” Maimane said. 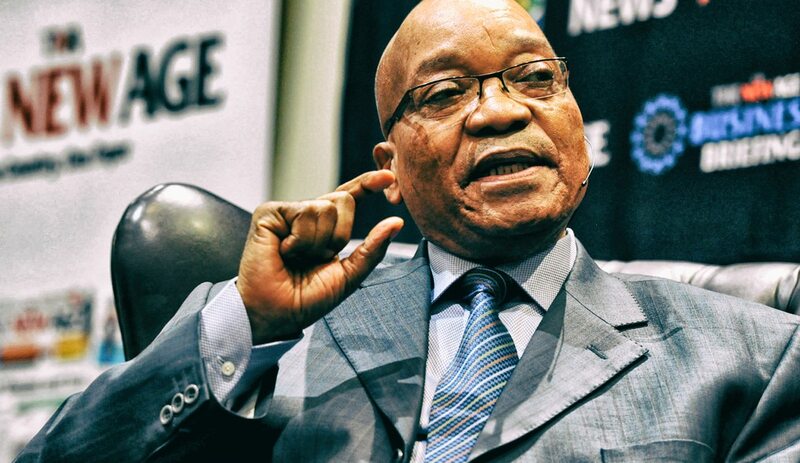 Zuma is facing increasing calls from various sectors of society to step down following his midnight reshuffle last Thursday and the downgrade decision is likely to increase those calls. While repeated attempts to get comment from the ANC failed, the ANC Women’s League said it was disappointed but not surprised by S&P’s “hasty” decision. “SA must not be held (to) ransom by rating agencies that are serving a certain political agenda … The ANCWL reiterates that S&P as an institution undermines the constitutional right of the State President to appoint his Cabinet and make changes when he deems necessary,” said Meokgo Matuba, ANCWL’s Secretary General. The EFF was yet to comment. “South Africa’s growth outlook has been dealt a severe blow … As a result of this downgrade all South Africans will be poorer and in particular it will put increased pressure on the most vulnerable sectors of our society,” the CEO’s Initiative said in a statement. According to the organisation, which is made up of business leaders from various sectors including among others the JSE, banks, mines and telecommunications, the downgrade could and should have been avoided had “the structural reforms necessary to underpin sustained and inclusive economic growth been implemented”. “The country will have to pay more interest on the money it borrows to deliver essential services such as housing and social welfare. It goes without saying that in a low-growth environment this leaves even less money for pressing national priorities such as education and healthcare,” it said. The Institute of Race Relations (IRR) agreed, saying the downgrade would trigger a series of economic setbacks that will affect the living standards of all. With growth rates having slipped to just 0.3% of GDP in 2016, the prospects for recession will now again appear on investor radars. Cronje said the deeper reason for the downgrade is the counterproductive nature of Cabinet policy-making since 2008. “Wastage and corruption together with the bailing out of a series of unproductive state-owned companies have squandered very precious tax resources that should have gone into infrastructure development and service delivery,” he said. Political analysts believe the latest development will increase pressure on Zuma and the ANC. Professor Susan Booysen of the Wits School of Governance said Zuma was considerably weaker than he has ever been but he was still “surrounded by a sycophantic group” that would go to great lengths to protect him. “He does seem to be buffered … and even those ANC leaders who do not agree with him balk when it comes to actually doing something … perhaps it’s the ringing of the smallanyana skeletons in the closet,” she said. “There would be those whose lack of confidence in the new leadership would be be vindicated by the ratings decision while others would see it as a decision by an imperialistic body,” Friedman said, adding that while S&P’s decision was significant, his reading of ratings agencies was that it was not an exact science, with decisions based on domestic business sentiment. The Organisation Undoing Tax Abuse (Outa) called on the African National Congress to recall Zuma. “We believe that if the authorities act swiftly, South Africa may be able to have the rest of the ratings agencies stay their decision for a downgrade, and eventually get S&P to reverse their decision,” Outa chairperson, Wayne Duvenage, said. Tinashe Chuchu from the Wits School of Economics said the ratings agencies worked on levels of trust and confidence in the experience of the minister of finance. “As long as this current finance minister is in place, we will not see any change. Gordhan and Jonas were trusted as gatekeepers. The only way to change the finance minister now would be to change the top leadership,” Chuchu said. Photo: President Jacob Zuma attends The New Age SABC Business breakfast held at the Grand West Casino Complex in Cape Town. 10/02/2012.